A stellar pedal that does exactly what it says on the tin. 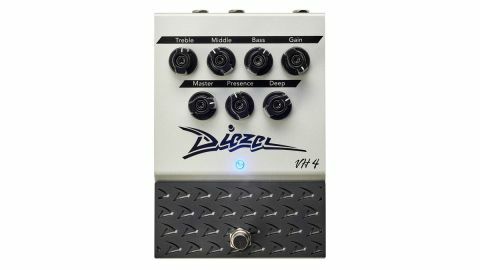 The Diezel VH4 is the amp that’s fuelled James Hetfield, Matt Bellamy and Billy Corgan with some of their angriest tones and this VH4 pedal brings you those same tones at just over 10 per cent of the head’s ticket. The VH4 has the most original sonic character on test. It sounds like itself, with a gravelly edge of ‘air’ present across its entire sweep. At first it feels like there isn’t as much gain as you might expect, because it never veers into ‘fizzy pedal’ territory, and with such a defined character comes a lack of versatility – there’s no escaping the throaty aggression. It’s ruddy huge though - both in tone and physical stature. It does its thing, and does it impeccably and unapologetically.